Portugal usually shares Sonic items with Europe. Items with a "European Release" will generally show up there as well, so it doesn't have a huge need for exclusive items. 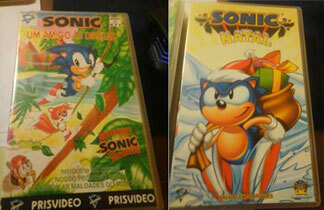 However, there are a few things which are made there, marketed only to there, or had Portugal as their main release area (but can show up elsewhere as well) This is a page for anything Portuguese Sonic, whether it's modern or classic. Here are 2 all-plastic pins from Portugal. They are by Triunfo (probably "Triumph") likely give-aways with a product or some kind of purchase. 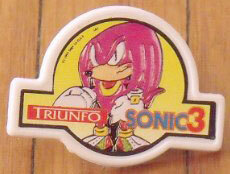 The third Triunfo pin appears, this time with poorly drawn Knuckles. They've chosen the rather off model look for him that was somewhat adopted by the UK Sonic the Comic, where his head is tall and his eyes are wierdly vertical. The fourth pin has to be Sonic, but Gear is still waiting for a photo of it. Triunfo makes cookies in Portugal.